I'm so excited to be posting here! Anna is such an artistic inspiration to me and I'm honored she asked me to share something with you all. 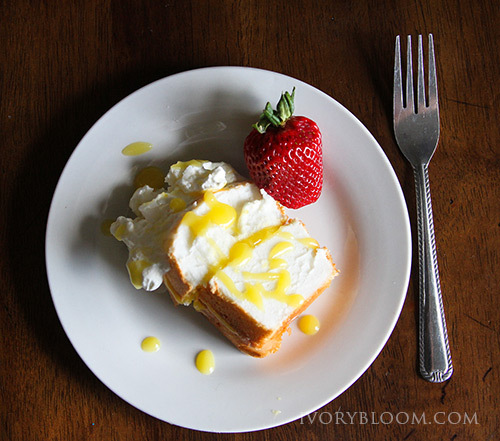 This is one of my favorite spring desserts, its super easy but looks (and tastes) amazing! 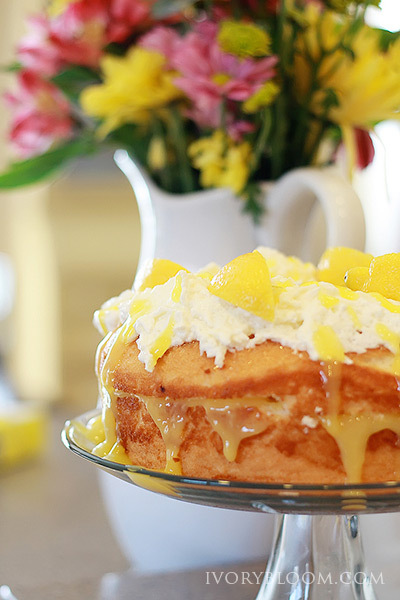 It would be great for a mother's day treat! 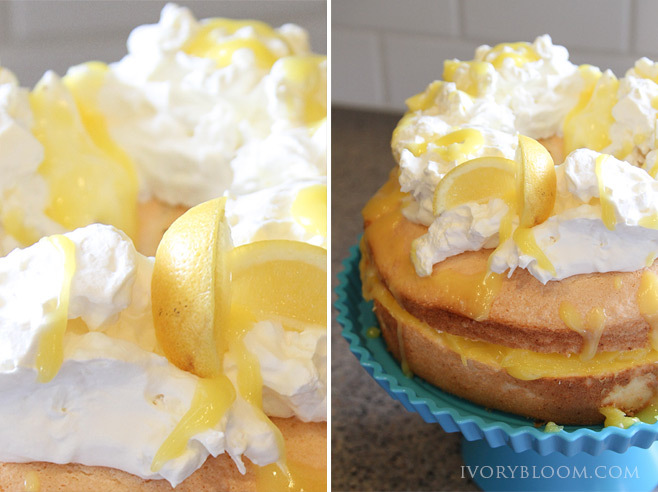 The greatest thing about this cake is you can make it as easy or difficult as you want. 1 batch lemon curd (recipe follows), you can use jarred if you're in a hurry but trust me - the lemon curd is what makes the cake! Lets start with the Lemon curd. In an mixing bowl (electric with the paddle attachment or glass if you're using a hand mixer) add lemon zest, sugar and butter; cream together. Add eggs one at a time, mixing until smooth. Add in salt and lemon juice. The mixture may be a little curdle-y. Pour this mixture in to a medium sauce pan and cook over low heat - stirring constantly - for about 8-10 minutes. You want thick enough to coat your wooden spoon. Take off the heat and strain the mixture in to a glass bowl. 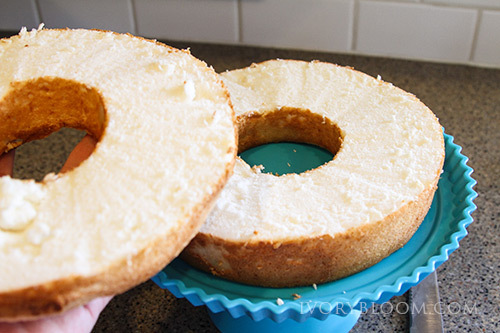 Next we are going to cut the angel food cake in half horizontally, like so. 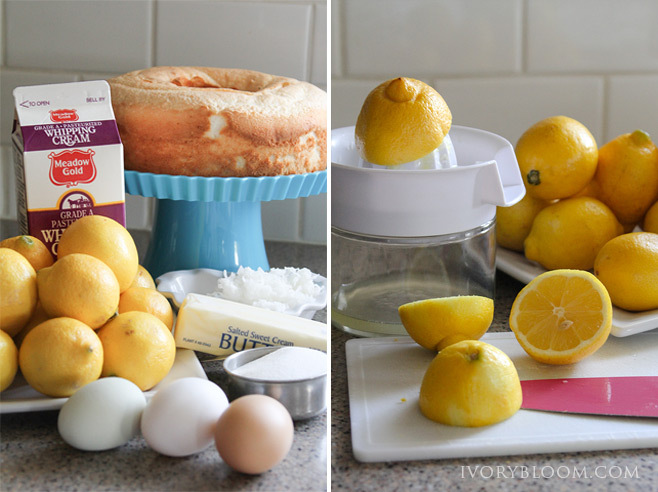 Slather the cake with lemon curd - not all of it but about 2/3 of the batch. Replace the top. And start on the topping. Whip the whipping cream until stiff. If you would like to sweeten the cream up a bit add a tablespoon of powdered sugar, you can do that. (Personally I don't add it, usually because I'm too lazy to get the powder sugar out of the pantry.) Before you add the coconut to the whipping cream be sure to break apart any large clumps. Very carefully fold in the cup of shredded coconut. Pile the coconut whipping cream mixture on top of the cake. 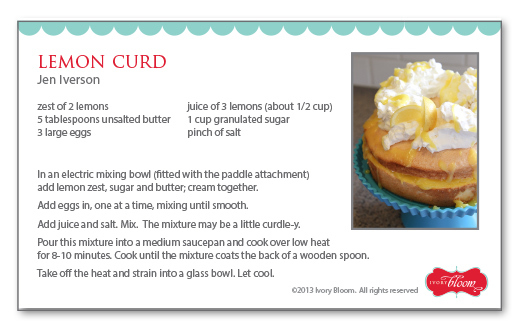 Then drizzle some lemon curd over the top (if the curd is too solid to drizzle heat in the microwave for 15 seconds). Garnish with a couple of lemon slices. And that's all there is to it! Hope you enjoy!